A phytochemical investigation of the methanolic extract from the roots of Lantana camara L. resulted in the isolation of a new compound, camaridin (1), together with five known compounds, oleanonic acid (2), lantadene A (3), oleanolic acid (4), lantanilic acid (5), and lantanolic acid (6). 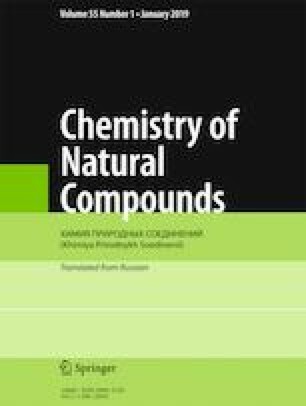 The structure of the new compound was determined through HR-EI-MS spectrometry and 1D and 2D NMR spectroscopic methods. Published in Khimiya Prirodnykh Soedinenii, No. 2, March–April, 2019, pp. 254–256.